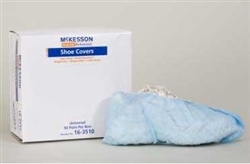 Medi-Pak Performance Non-Skid One Size Fits Most Shoe Covers are disposable shoe covers. They are blue in color and made of a durable spun bonded polypropylene that is fluid resistant. They feature non-skid strips on the soles that help cut down on accidental slips and falls. Medi-Pak Shoe Covers are cool and comfortable to wear. They utilize elastic tops to ensure a snug fit. They are designed to be single use disposable shoe covers.